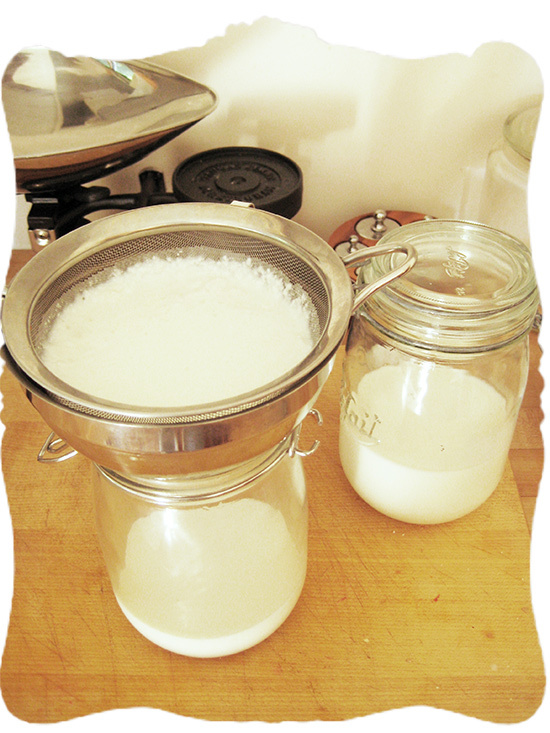 Living near the beautiful old English biodynamic dairy farm, I grew very fond of drinking kefir. Like yogurt, kefir is a cultured milk, fermented using kefir grains. Like kombucha the culture is a symbiosis of yeasts and bacteria, and an ancient drink. It is a probiotic, and thoroughly excellent for digestion. To my delight I received milk kefir grains from a dear friend in Canada this summer. My tall girl thinks they look like a cup of rice pudding. They were resting in water when I received them waiting for me to get started. 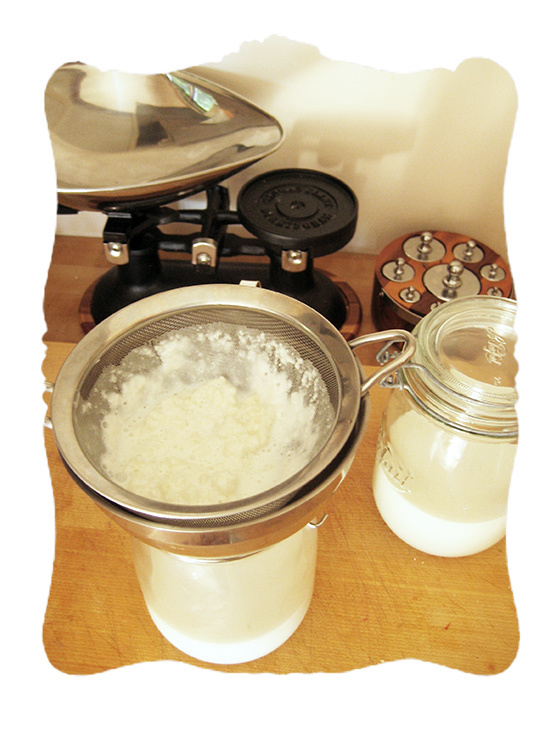 I set some whole goat’s milk out to come to room temperature, so as not to shock the grains. 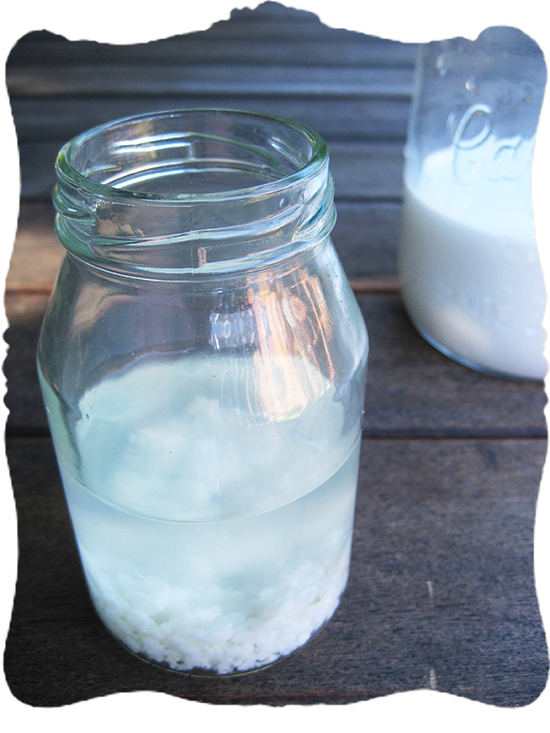 Then I set the strained kefir grains in a clean glass jar, poured the milk over, and covered it. 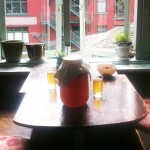 Some people say to cover kefir with cloth, like a fermenting vinegar, others use a glass lid. After a few months of messing about with timing and proportions, I’m happy with my kefir process. I like to leave the kefir fermenting on the counter in a warm spot away from light, until I can see the whey separating, as it acquires a sparkling tingle like buttermilk or mild ginger beer. My children aren’t so fond of the stuff, so I just make about a pint at a time. So far my grains seem happy with that, but I’ll give some away when they outgrow those proportions – the grains will multiply, like kombucha mushrooms and sourdough cultures. I set a steel strainer (best to avoid other metals!) over another clean jar, stir my kefir, and strain it through. The grains remain, ready to place in a jar for the next batch of milk. I use three glass canning jars in rotation – one to set the milk in to come to room temperature, waiting for the grains to be added; one to hold the fermenting kefir; and one to catch the finished kefir. I put the finished kefir in the fridge to drink later, often first thing in the morning. It is the sort of habit the steadies me, and at the same time, works best if I’m being consistent with this and other rituals and routines in my life. One feeds the other, just as caring for my kefir means that it cares for my health. Quite nice. 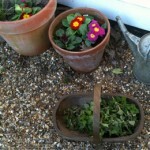 This entry was posted in autumn, kitchen garden and tagged dairy, fermentation, health, homemade, kefir by Elisa.